A quick and important update! Deadline is reporting that Robe Wade has been tapped to be the new executive producer for Dancing With The Stars. Rob Wade has been tapped to take over as showrunner of ABC’s Dancing With the Stars starting with the next 19th cycle, which has not been formally picked up but is fully expected to. Wade, a DWTS veteran, will succeed Conrad Green, the show’s executive producer/showrunner since its launch, who is departing after the 18th season finale next month to join new Fox series Utopia as executive producer. Wade was a producer on DWTS for the first 11 seasons, including a stint as co-executive producer under Green from Season 5 in 2007 to Season 11 in 2010. “Rob was a part of the DWTS family from the very beginning and in our mind, there was no one who made more sense to come aboard and take the show into its next era than him,” said Jane Tranter, head of BBC Worldwide Prods., which produces DWTS. Wade will serve as executive producer alongside Ashely Edens-Shaffer and Joe Sungkur. 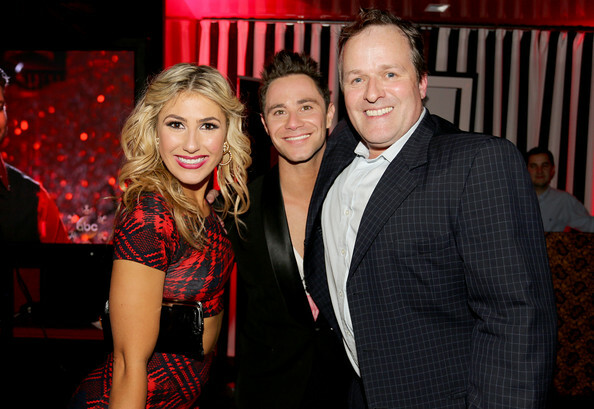 “Dancing with the Stars is in great shape and I look forward to getting back in the ballroom and working with Joe and Ashley to take it to the next level,” Wade said. Sounds good to me. What do you think?? To read more, see Deadline. Thanks to Lisa for the heads up! Ya know… Conrad Green has received a lot of negativity because of all the changes to the show this season (and the last season), but, I don’t want him to leave Dancing With The Stars. Like it or not, he’s helped to keep this a popular show and I love it even when I’m not happy sometimes with some changes, etc. Here is more from Deadline about him leaving Dancing With The Stars. For more, see Deadline. Thanks to Lisa for the heads up! Have some of you seen the “Life & Style” article where they reported the cast and producers of Dancing With The Stars aren’t happy with Erin Andrews? Insiders reveal to Life & Style DWTS producers aren’t too happy with their brand-new hire, Erin Andrews. “She’s arrogant, obnoxious and difficult to deal with,” an insider explains to Life & Style, on newsstands now. “So far, Erin hasn’t made any friends,” another DWTS *insider reveals to the mag of their new co-host, who replaced longtime co-host *Brooke Burke-Charvet**. Well, Rumor Fix asked Executive Producer Conrad Green about it. Below is a quote with his reply back. Be sure to see Rumor Fix for more as Erin’s rep commented as well. E Online also has an article posted about it. My thougths: Hmmm, I have to wonder if there isn’t some truth in it being many of us aren’t happy with Erin either and want Brooke BACK!! Executive Producer Conrad Green lays out 9 new changes for the new season of Dancing With The Stars at TV Guide. Below are a few we haven’t heard about yet. A must read!! Not sure what to think about the “new voting” or “lots of guest judges”. We’ll soon see? Be sure you read more at the link! 6. New theme nights: Among the theme nights Green has teased are Party Anthems night, American Icons night and possibly a Disney music night. (“As soon as our celebrities and dancers heard that, everyone got very excited and was talking about being princesses and stuff like this,” Green says.) The show will also likely revisit Latin night and Most Memorable Year of My Life night. 7. Lots of guest judges: Though no names have been released yet, Green says there will likely be a guest judge on the panel nearly every week beginning in April — in addition to the permanent panel of Len Goodman, Carrie Ann Inaba and Bruno Tonioli. “They’re going to be a mixture of people from the world of music, big stars from ABC, ex-dancers … a real range of people, all of whom have an opinion and have a knowledge and can bring something to the judging,” Green says. 9. A new ballroom look: Longtime viewers will also notice that the ballroom looks a little different this year. The proscenium arch will be gone and a much bigger video screen will be featured at the back of the stage, while a smaller stage near the band will be used for more intimate performances. The skybox will also be making a comeback. “We’ve re-jiggered the ballroom quite a lot,” Green says. “It’s going to feel like a much bigger, deeper ballroom.” Some changes will also be made to the warm-up room as well. Viewers may cast their votes for their favorite teams via phone on Monday nights during and up to 60 minutes after the end of the “Dancing with the Stars” broadcast in each time zone. Online voting at www.ABC.com and on Facebook at https://apps.facebook.com/votedwts/ is open for 24 hours, beginning from the start of each episode on the East Coast at 8:00 p.m., ET/5:00 p.m., PT and closing at 8:00 p.m., ET/5:00 p.m., PT on Tuesday evenings. For the final week, on Monday, May 19, online voting will open for 15 hours, beginning from the start of the episode on the East Coast at 8:00 p.m., ET/5:00 p.m., PT and closing at 11:00 a.m., ET/8:00 a.m., PT the next day. A custom Facebook app lets fans vote, share whom they voted for and say why, as well as see whom friends voted for. Ok, so I know there has been a lot of controversy surrounding the nixing of the Dancing With The Stars orchestra. I loved them too, but, I think this change is going to be a good one. If you watched the recent Emmy Awards, then you know what I mean. More below from BroadwayWorld.com on the new musical director for Dancing With The Stars Ray Chew…and his BAND. Thanks to @DWTSgossip for the heads up. Let us know what you think. “Dancing with the Stars” will welcome Music Director and Composer Ray Chew to the ballroom with the premiere of season 18 on Monday, March 17 at 8:00 p.m., ET on the ABC Television Network. Chew’s band will feature a new line-up of live musicians and singers performing music ranging from the latest pop hits to the great standards of the past. Chew has most recently served as the Music Director of the 65th Annual Emmy® Awards. He has also been seen on such network television series and specials as “American Idol,” “It’s Showtime at the Apollo,” and additional historic landmark events ranging from President Obama’s Inaugural Neighborhood Ball to the Democratic National Convention. Chew also conducted a 63 piece orchestra for Carnegie Hall’s sold out “A Night of Inspiration,” a live event he produced as part of their diversity series. To read the article in full, see BroadwayWorld.com. Much respect to the legacy of Harold Wheeler and what he’s done on Dancing With The Stars! I’ve spoken to Harold – my good friend and mentor for many years -and he’s given me his blessings moving forward. I look forward to supporting the dancers w/ live musicians of various configurations, determined by the style & genre of each perf. This will be an exciting season for all of us – tune in to #DWTS March 17th on @ABCNetwork!!! Awesome. Let’s wish him the best! How clued-in are the judges to the popular vote? The judges have never known those figures. They’ve never seen a single vote. There’s two voting documents — one comes from the phone company and one comes from ABC.com, which includes the Facebook votes. We get those numbers and put them into a grid and determine the results from the control room, on the spot. It’s only me and [a representative of ABC’s] Broadcast & Standards who see them. No one, even the upper execs on the show, ever see that document. And so while the judges might have the same opinion that anyone else has as to how popular certain couples are — they don’t know. In practice, it’s kind of difficult for the judges because no matter what they do, they seem to get lambasted. Look, don’t get me wrong, all of us as viewers have our own opinion about scores that are given. Sometimes you go, “Really?” But then again, I’m not a dancer. They are from dance and they know this. And I kind of think you’re never gonna be able to give a score that everyone can agree on. You can tell that just by reading the comments below the line. People are furious that it was either too high or too low. And the judging on this show is very difficult — we’re the only show where they have to hold up a number and be accountable for it. You could be fake, or damning, or warm — but you don’t have to be consistent. Our judges can say what they want. But then they have to hold up a paddle. So sometimes they’ll be trying to say something encouraging — they feel someone’s having a tough time, so they’ll say something quite nice… but then they’ll hold up a 7. And people say “Well why would you do that?” Well, because they don’t want to beat the guy up! The next week, they might give him an 8 but be more critical. It’s really tricky, because you also want to be able to encourage, give notes, plan improvement. And then there’s the question: Do you judge people relative to each other? Do you judge on just, that feels like an 8 to me? Or do you judge it relative to the contestant’s improvement? I suppose it may always seem to angry viewers like the judges are “in on it” and orchestrating results. The problem is, you can’t ever convince people that’s not the case because people just choose to believe that. It’s not the case. The whole point of this show — and it obviously is easier when the public votes after the judges instead of the public vote carrying over — but the point of the show is that the public along with the judges are picking the winner. So it’s kind of a self-fulfilling prophecy for us. You want the voters to be involved in that process. This is why, when people say, “Well, the judges’ scores should carry more weight; it’s crazy if someone like Elizabeth goes” — well yeah, I get it. I’d have liked to see Elizabeth in the final, I must admit, because she’s great as a dancer. But then if the public really want other people there, I’m kind of fine with that. Okay, Conrad – but you never give them hints?? I suppose those three might be smart enough to figure out who’s doing well and who to protect all on their own. But I can’t believe there is NO manipulation going on. Well, I was rather underwhelmed by the first half of the show. Didn’t care for Val and Elizabeth and I’m not sure why. Didn’t like Brant – too weak. Loved Snookie, Loved Amber, Loved Bill. I would say those are my top three and two of them were either sick or hurt. Has anyone noticed that Derek’s partners seem to do even better when under more pressure? 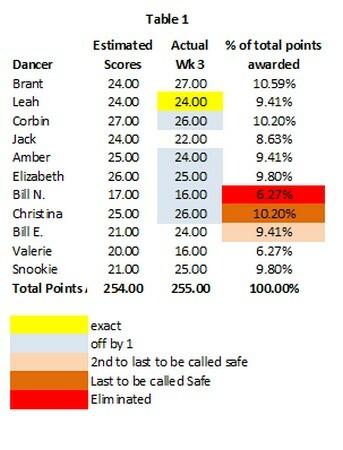 Snookie was called safe first, then Valerie and Tristan were eliminated. Sad, but she had a good run. This week, I saw lots of questions about Bill Nye’s departure from the show. Some said there was no way that others got more votes than him. To which I responded, “they didn’t have to, Bill could get more votes and still be eliminated if he didn’t cover the spread.” This is the thing that continually gets lost no matter how many times I write these numbers posts. Bill Nye was WAY below the next highest scorer, so HE had to make up lots of votes in order to stick around. I saw some comments saying it was “fishy”. Was it fishy? Well, it certainly could be, depending on your perspective. I mean, really, Brant got a 27? I don’t think so, in a real world. There is no way he did a better job dancing than so many couples. But he most likely was in danger of leaving and was, thus, overscored to protect him from Bill Nye. You overscore Brant and make sure others who might not be getting the votes have enough of a lead on Bill Nye and it’s perfectly plausible that Bill goes home. How did the night stack up once all was said and done?? See below. Looking at that table, it seems to me that Brant was grossly overscored and Christina was overscored a bit, relative to Amber. Is it a coincidence that two people likely at risk due to Bill Nye but who are good dancers are overscored? I don’t think so. I think Liz is also in potential danger, but she danced very well, so I wouldn’t say she was overscored. Bill’s low score gives her breathing room. The people in danger, IMO, are scored high enough to put them out of reach, those who are getting votes are getting more realistic scores. Just my speculation. So, what did Bill Nye have to do to actually stay on the show and how did others have to do in terms of votes to be safe? See below. Read more..